Many of the native islanders suffered greatly at the hands of the Japanese after the Imperial forces invaded Guam on Dec. 8, 1941. They tell stories of people being beaten or killed for not adhering to the commands of the Japanese, such as bowing or showing respect to Japanese soldiers. Young women were taken away from their families to become comfort women for the soldiers during that time. Men were forced to build two air strips for Japanese military air planes. There were a few who died after it was discovered they were hiding a Navy radio man, George Tweed. Among them was the late Father Jesus Baza Duenas, who was beheaded for aiding Tweed. The sailor was among six others hiding from the Japanese, but he was the only one who survived. Tweed eventually escaped and was rescued by a Navy ship days before the recapture of the island by American forces. As the American Forces began their plan to recapture Guam, Chamorros were gathered and marched to concentration camps, the main one in a valley called Manenggon, in the village of Yona. In the southern part of Guam, Japanese soldier forced several Chamorros into caves. The soldiers threw in grenades, killing the Chamorros. Once the Americans landed, the Japanese were able to defend themselves but began to retreat further inland and into the mountains. Day by day, American soldiers made their way into Guam’s jungles fighting until August 8, 1944 when the Americans were able to secure Guam. 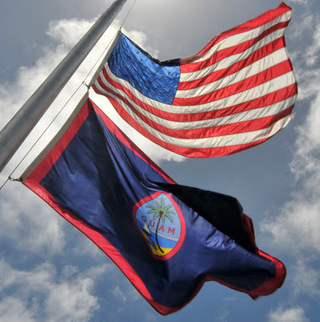 The Chamorros were grateful for the arrival of the Americans and since then, every year on July, 21; festivities, including a parade are held, thanking the U.S. for saving the people from the Japanese. A native Chamorro from the island of Guam, Zita Y. Taitano, grew up hearing stories from her mother Isabel Taitano (deceased), and her many aunts and uncles about the Japanese occupation during World War II. Her father Jesus Taitano (deceased) was in the U.S. Navy at the time and heard little about what has happening on Guam because he was in Europe. Zita is a long-time journalist and worked for media outlets on Guam, including the Pacific Daily News, Marianas Variety (currently The Guam Daily Post), KUAM, and Sorensen Media Group (Pacific News Center, Newstalk K57, Power 98 and 105 The KAT). She currently is a freelance writer for the Guam Daily Post and resides in Jonesboro, Arkansas.